As men of God, vicars are often telling their parishioners to turn the other cheek. But one reverend rather struggled to follow the example – and has now been forced to take three months off after he accused some of his congregation of being 'arrogant gossips'. In a 1,200-word letter, Andy Thewlis complained of a daily tide of 'grumbling and disunity' among 'critical and negative' members of All Saints Church had robbed him of enthusiasm for the job. 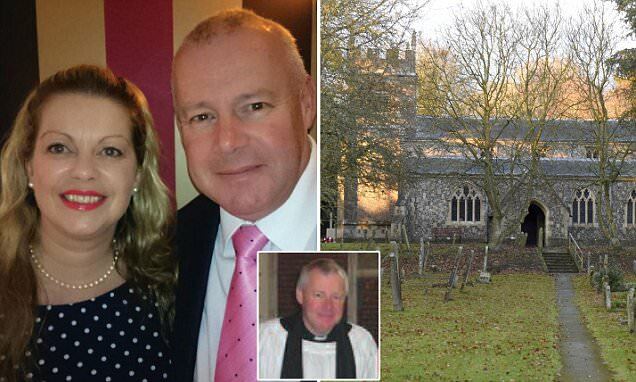 He and his wife Sarah-Jane are now looking to move from the church in Burbage, Wiltshire, after only a year in the post – claiming they are not prepared to sacrifice their health and marriage for it. The accusations caused shockwaves when the letter was sent out to church members three weeks ago, and Mr Thewlis was summoned to see the Bishop of Salisbury. He then apologised for his 'inappropriate' letter in a second note posted to his congregation, and said he would take a three-month sabbatical while he looks to move to another ministry. Mr Thewlis came to Wiltshire in October last year after 21 years of working at a church on Jersey. In his bombshell letter, dated November 16, he said claims that All Saints was a 'charismatic evangelical church' couldn't be further from the truth – and that all his hopes for the new job had been 'lost'. He continued: 'The Sunday morning worship experience is neither warm, nor welcoming. Rather it reflects an organisation that is characterised by grumbling, gossip, and disunity. Criticism and negativism are predominant behaviour traits in too many church members.